POUND EXCLAIM # ! : Quantify All The Things!!! One of the best websites around is imdb.com. The Internet Movie DataBase. It has it all. Actors, directors, runtime, critic reviews, user reviews, movie rating, and on and on and anything you could want to know about a movie or television show. (Note: the site has been owned by Amazon since 1998). Another movie ratings site is rottentomatoes.com. It has most of the same information about the media. (Note: site owned by Time Warner). But you will notice a pretty substantial difference in the ratings. For starters, it differentiates between critic rating and user rating for the given movie/show. Whereas IMDB displays a conglomerate score (based mainly, I would assume, on user ratings). However, the ratings on Rotten Tomatoes are difficult to interpret. The site skews toward (wannabe) elitist-movie-snob. So a movie with a 58% rating might actually be a really great movie. IMDB, on the other hand, paints a ratings picture with a broader brush stroke. If a movie is 5.8/10, I know it won't be very good but I probably won't regret putting the time in. The point is that I, personally, have set my movie score barometer to IMDB. I can look at the rating and immediately have a pretty good impression of the quality of the film or show. Also, I think Rotten Tomatoes users will not watch a movie based on the RottenTomatoes score. It's like saying, "uh, I only drink 18-year single barrel scotch and this is a 12-year blend." It's something about the attitude that bothers me. Anyways, this has all been a tangent. 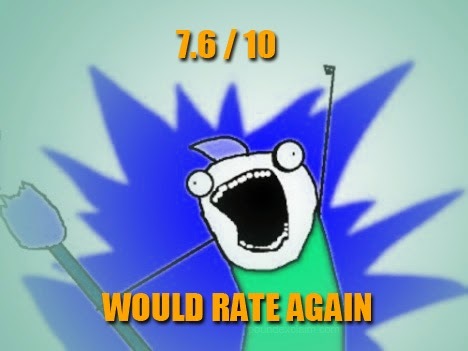 The real point is about rating things. We--as a society--have to quantify everything. How tall are you? How much do you weigh? Am I hotornot(.com)? You can't say "you see how tall I am" or "what, are you going to lift me?" or "meh, like 6ish." Why isn't there a good ratings site for books? This website has the most potential to be the IMDB of books. In fact, it was acquired by Amazon in early 2013. And I think that company knows a thing or two about stuff. I signed up for it a couple years ago, but then quit because it was useless and kept emailing me about things I didn't care about and wanting me to connect to friends and junk. I signed-down, or un-signed-up, or whatever, but it still knows who I am and still sends me emails and wants me to connect! Staaahp! You know what, though? I still use it to read reviews on books. How do you choose what to read next? You either get a recommendation from someone, have a pre-made list you're trying to tackle, pick up something randomly at the store/library, or [other]. But if you're not sure you want to read something and want to get some feedback on whether or not it will be worth your time, where do you go? Who do you trust? A movie is a small investment. Maybe 90-150 minutes of your life. Even if it's not good, you stay until the end and then tell all your friends about how double-plus-un-good it was (for instance, all of the LOTR movies). A book, though, that can average anywhere from 4-20 hours of your life. And for what? You could stop, sure, but what if it gets good later? So you could ask a friend if they've read it and what they think. Or you could read the user reviews on websites that sell the book. Or maybe google or wikipedia has some information for you. However, there isn't really a wam-bam-thankyou-ma'am quick rating and synopsis website yet. Goodreads is getting there. It tells me how many pages, gives a brief synopsis, and gives a star rating (out of five), among some other things. What more could a boy wish for? This is where we get back into the "ratings barometer" part of the discussion. Good reads is skewed. And in this case, it is skewed not toward the high-brow elitists, but toward the lowest common denominator. Think about the time investment in books. That alone is going to make you rate something higher for the simple fact that you finished it and want to believe that it was a good use of your time. Plus you only get to rate it out of five. Where is the allocation for nuance? Also, just finishing a book is a huge accomplishment for some people. Therefore, they're more likely to rate it higher because each book they read is the best book they've read recently. Also, think about who is more likely to rate a book on a website. Yeah, teenage girls. Let's get into some examples. Twilight. Goodreads rating: 3.57/5 stars. The movie adaptation scored 49% on RT, and 5.2/10 on IMDB. Either the book was way better (like, duh) or there is a ratings bias. I started reading the book: terrible. The Great Gatsby. GR rating 3.82/5. Most recent movie scored RT: 49% (wow, tough crowd) and IMDB: 7.3/10. One of the greatest literary works scored only .25% higher than Twilight. The highest rated movie on IMDB is Shawshank Redemption (9.3/10). The highest rated movie on Rotten Tomatoes is Toy Story 2 (100%). The highest rated book on GoodReads is, well, they haven't quite made it possible to search like that yet, but the highest I found is The Complete Calvin and Hobbes (4.8/5). I guess you can't really argue with that. As GoodReads is still in its infancy with Amazon, it could still turn out to be great. But until they get a better UI, smarter database, and a better review system, it will suffer as the ultimate books ratings catalog. They will also have to find a better way to handle duplicity (same book, different publication edition, translation, etc). You guys, just make it happen already! I need quantified data, generalized for easy consumption. So, read anything good lately? This was a really interesting read. I am also surprised to hear that there is no good comprehensive site for rating books like imdb. I finished irobot and really enjoyed it. I liked it because it was segmented, short, easy language, and very interesting ideas to mull over while reading. Would recommend.